The Wikipad will feature open-source touchscreen gaming with optional buttons. The gaming world has been keeping a very close eye on the upcoming Ouya console, set to bring Android gaming to television sets. You might be surprised to know that the Ouya isn't the only Android gaming platform currently in development; another team has been hard at work on the Wikipad, a tablet that aims to combine the best features of touchscreen devices with handheld gaming systems. With a planned release and the end of Q3 this year, the Wikipad team revealed their recently updated specifications to VentureBeat to show consumers what they have to offer. The Wikipad is planned to be one of the lightest and thinnest on the market, weighing 560 grams and powering a 10.1 inch screen capable of displaying a 1280 x 800 resolution. The device will use a NVIDIA Tegra 3 1.4GHz quad-core processor with 1GB of of RAM, which is actually fairly similar to the Ouya's processing power. In terms of storage space, the Wikipad will come with at least 16GB, although since the design hasn't been finalized it could go even higher. It will also use a 23.46Wh battery capable of six hours of gaming or eight hours of video playback. One common criticism of tablet games is that touchscreens cannot provide the tactile responses that buttons do, so the Wikipad will address this concern by shipping with a proprietary controller. The controller attaches to the bottom of the tablet and wraps around the sides, converting the touchscreen into a device more reminiscent of a traditional gaming handheld. The controller will carry two triggers, bumpers, analog sticks, four primary buttons, as well as a standard start and select button. Additional, the controller redirects sound from the tablet's standard speakers to enhanced speakers positioned on the controller's front grill. 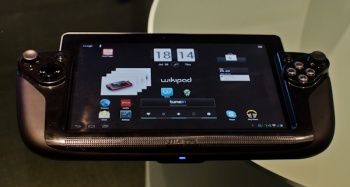 The Wikipad will launch with Android 4.1 and support game streaming through Gaikai, which should allow it access to a wide range of titles at launch. While the system hasn't received the same public attention as the Ouya, the fact that multiple Android consoles were announced this year is very suggestive of developer-friendly trends emerging in the industry. The Wikipad's success isn't guaranteed, but with its release date fast approaching, it will be a good opportunity to see whether actual consumers are ready for an open-source gaming platform. No one heard of this yet because? Android is really trying to get into the Video Game Market, that's obvious. I don't know how well the Android Wikipad will sell though. Certainly can't beat the Nintendo 3DS, though it could probably take on the PS Vita. Kinda reminiscent of the Sega Game Gear, it's certainly a relief knowing we don't have to feed it 6 AA batteries every 2 to 3 hours. On a side note, I'm starting to notice a bit worrying trend with these devices, it's great that they have their own gaming buttons and pads, but they all seem to go for their own design instead of a standardized one, making it a bit of a hassle for developers to code for each specific pad configuration for each Android device. Maybe I'm a bit paranoid, but that's just my opinion. I don't know what kind of games will be available, I doubt it will be most cutting edge (or perhaps I'm wrong?). But it would be cool if you could also buy a more traditional controller, connect this bad boy to a tv and game in a more traditional manner. Hell, depending on with what quality you can play movies. You could make yourself a slim, portable media center. Game on your flatscreen when at home. Game on the tablet when out on the road. Just allow key/axis assignment and it won't matter what layout the controller has. That's what emulators do, and it has worked pretty well for them. On the other hand, I'm not sure about this one. I have a 10" tablet(Xoom)and I can't imagine controls stuck to either end resulting in anything that isn't extremely unwieldy. A 7" tablet might have been better for this purpose, especially if it isn't going to have a high resolution screen. Its a lame work around. Or any of the other handheld KIRFs out there. Actually the latest incarnation of Yinlips make it seem as if it will be superior and less expensive than this. Upwards of 1.5 processor, upwards of 1gb ram, Upwards of Android 4.0 (Ice cream sammich) in a more logical hand held size, with native hand held controls... plus esier access for things like... shoulder buttons. Hmmm, not a very aesthetically pleasing setup. But if all this increased interest in Android leads to an improvement its gaming, I'm all for it. If you rub hard enough on the name, it just reads Wii U. In all fairness, the first two you posted look even worse than the one featured in the article, and all of them look to be the size of a phone rather than a tablet. I maintain that 7" would probably be a better sweet spot for this sort of thing than a 10", but what you are talking about isn't quite the same thing. Not quite apples and oranges... more like oranges and tangerines. Think you missed the context. I referenced these hand helds... because they have built in controls. (IE: Why I said, "why not do this?" and pointed to devices with built in controls mechanisms.) The first two should hypothetically look worse (though they dont because the suggestion in the article looks horrifically bad)(Just from an aesthetic standpoint, how do either of them look bad?) considering they are hand helds for a niche (open source) market released in 2009 and 2010 respectively. The point was that if your going to build an electronic device to do this... dont retrofit a tablet with inferior specs for your new unreleased product with a bolt on controller when a device with superior specs and built in controls (including shoulder buttons) already exists and goes for 120$ USD or less. Basically... what this is, is a weak tablet with an even weaker gimmicky bolt on controller(that looks looks devoid of shoulder buttons) in a market already over saturated with gimmicky disposable tablets. Another tablet? Not even remotely news. True open source proper hand held device with modern specs and reasonable cost? Thats worth looking at. I don't think it's worth batting an eyelid at either, but for different reasons. I've ordered a Raspberry Pi. There are a lot of other open ARM boards out there, but I chose the RPi over the others for one reason: incredibly strong community support. The RPi has an active community that is figuring that board out and building all sorts of things for it. Whether it's the Ouya, the... *looks back at the article again* ...Wikipad, or some other device, the Android gaming machine I choose will be picked for the same reason I picked the RPi. Until that point, any purchase is a waste of money for me. I'm wondering what this thing's gonna cost. Ouya's looking at a $99 price point, and might make it. But this thing has a pretty decent screen on top of that, and those don't come cheap (no mention of capacitive or not). As Viranimus mentioned above, no point in tacking on a controller, since the cradle could then feasibly be used with other tablets, should've just had the buttons built into the system itself. Overall, I have no intention of buying this. From what I'm reading this will probably only work with the Gaikai "Cloud" gaming service. I won't stream video games. The bandwidth cost is too high, and is a waist of power and resources. If that control was using a Standard Driver so that any Android game could use it then I'd consider it, but it probably is using a custom driver that makes it only work on that 1 Tablet and thus defeats the purpose of putting it on an Android in the first place. In the end The problem that Tablets don't come with a standard controller will kill the idea of serious gaming. There are some games that will work well on a Tablet but many others that just wont. You need a standard API for this to catch on. They'll be able to expand when I can take my Android phone and put it in a docking station and have it be my PC keyboard and all. Then FPS and RTS will be functional on Android. Aaannndd there goes my battery life..
"We already put Ouya out of business"
Oh come on, this offering will absolutely blitz the Ouya. If it has a HDMI OUT you can just plug it in your TV and connect a PS3 controller to the tablet.